India could reduce the water it uses for irrigation by a third, and simultaneously address its persistent malnutrition problem, if it replaced its rice crop with more nutritious and less thirsty cereals, a study of irrigation-water use over 43 years has found. Of the cereals grown in India, rice consumes the most water per tonne of output while delivering the least nutrients — iron, zinc and protein — according to the study published in Science Advances, a global science journal. The suggested replacements for rice are maize, finger millet, pearl millet and sorghum, all of which consume less water per tonne and are more nutritious. In a first, scientists juxtaposed this potential water-saving from an alternative cropping pattern with the nutritional gains that would follow from growing more nutrient-dense and less water-intensive cereals. Replacing rice with a more nutrient-rich or water-efficient crop would marginally improve the production of protein (1 percent) but considerably increase the production of iron and zinc, by 27 percent and 13 percent respectively. These findings are significant considering that India is currently facing the worst water crisis in its history and continues to battle iron and zinc deficiencies. The study, 'Alternative cereals can improve water use and nutrient supply in India', was published on 4 July. Twenty-one Indian cities will run out of groundwater by 2020, NITI Aayog, the government's policy think-tank, had predicted last month. While the common belief is that urbanisation and industrialisation are the reasons for the falling groundwater levels across India, over nine-tenths of groundwater is extracted for irrigation, IndiaSpend reported in November 2016. 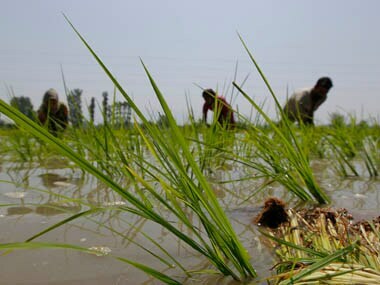 Roughly one-third (34 percent) of the 632 cubic kilometre (cu km) of water that India used to grow cereals in 2009 came from various irrigation sources, the new study said. Rainfall accounted for the rest. While India is food secure today, the new study showed that this achievement has come at the cost of water security, and has failed to substantially improve Indians' nutrition status, particularly iron and zinc sufficiency. Just over half (53 percent) of Indian women of reproductive age (15 to 49 years) were estimated to be anaemic — a result of iron deficiency — in the fourth National Family Health Survey of 2015-16, IndiaSpend reported in November 2017. More than a third of the Indian population is zinc-deprived, as reported in September 2017. Now it appears a solution is at hand to reverse these deficiencies while achieving water security and livelihood security for farmers. A "massive win-win" is how Mihir Shah, economist and former member of the Planning Commission and co-founder of water and livelihood security initiative Samaj Pragati Sahayog, described the cropping change solution. India's cereal production increased 230 percent between 1966 and 2009, according to the new study, and credit for this goes to the vast improvements in irrigation infrastructure across India. Irrigation sources contributed 86 percent of the increase in water usage for cereal production during this period. Rainwater used for agriculture on rainfed lands reduced from 300 cu.km to 219 cu.km. This fall expresses both the expansion of the irrigated area and the decline in average rainfall in recent decades, Ashwini Chhatre, co-author of the present study and associate professor of public policy and academic director at the Bharti Institute of Public Policy at the Indian School of Business, Hyderabad, told IndiaSpend. Average rainfall declined from 1,050 mm in the kharif (monsoon) season of 1970 to less than 1,000 mm in kharif 2015. 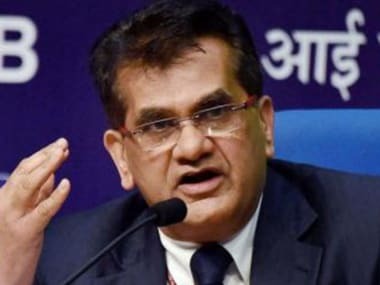 Similarly, in the winter cropping or rabi season, average rainfall declined from roughly 150 mm in 1970 to about 100 mm in 2015, the IndiaSpend report on the findings of the new NITI Aayog study further added. The number of days without rainfall during the monsoon increased from 40 percent in 1970 to 45 percent in 2015. "Protective irrigation is vital to insure farmers (growing) alternative cereals against dry days and dry spells during the monsoon, both of which are now established outcomes of climate change," said Chhatre. Cereal consumption and cropping data show that the shift towards rice-wheat consumption and cropping has intensified since the 'Green Revolution' of the 1960s. Between the mid-1960s and 2010, an urban Indian's wheat consumption almost doubled, from 27 kilograms to 52 kilograms. This plate-share gain came at the cost of the consumption of sorghum and millets, reducing their average annual per capita consumption from 32.9 kilograms to 4.2 kilograms. As a result, since 1956, the area under millets and sorghum has shrunk: 23 percent for pearl millet, 49 percent for finger millet, 64 percent for sorghum and 85 percent for small (or minor) millets. This dietary shift is typically believed to have been demand-led, as wheat is seen as being superior to millets and sorghum, and the cereal preferred by the more affluent Indians. This study, however, showed that the shift is significantly supply-driven, reflecting a "substantial influence from the country's Public Distribution System", the food security programme for low-income households. By providing a guaranteed minimum support price to producers and placing heavy subsidies on rice and wheat at the consumer end, this system "has also served to influence cropping and dietary choices away from more nutrient-rich alternative cereals and is an important factor contributing to the persistence of widespread nutrient deficiencies", the study noted. "Chief minister NT Rama Rao's promise of rice at Rs 2 per kg in 1982 in erstwhile Andhra Pradesh changed the dietary preferences of the last two generations, from millets to rice, without any commensurate improvement in health," Chhatre added by way of more examples to show this supply-side push. Partly as a result of this, anaemia in women of reproductive age — a key indicator of the health status of a society — has increased in Telangana (part of erstwhile Andhra Pradesh), from 49.8 percent in the first National Family Health Survey (NFHS) in 1999-2000 to 55 percent in the latest NFHS in 2015-16. Shah advocated introducing healthier millets and pulses into the 'Mid-Day Meal' scheme and Integrated Child Development Services scheme, to create sizeable demand for these crops and to create a structure of incentives for farmers to grow them. This could be followed by the decentralised procurement of the crops by the government for supply to these schemes. "At present, we only incentivise the growing of water-intensive crops because those are the only crops we procure," he said. This study has also found that swapping rice for an alternative cereal would not entail a fall in production, which could have implied a shortage of food grain. 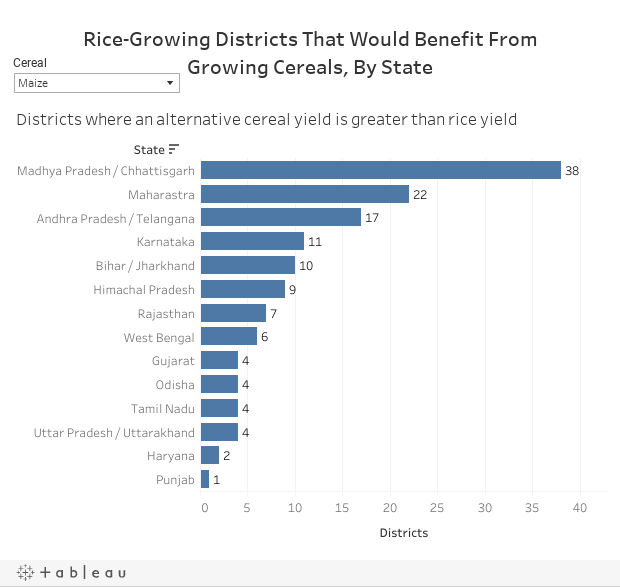 For instance, switching from rice to maize in 38 rice-growing districts in Madhya Pradesh would actually increase the yield, as would happen in 22 rice-growing districts in Maharashtra. Swapping rice for sorghum in 31 rice-growing districts in Madhya Pradesh and in 14 districts in Maharashtra would produce a higher yield, it added. Punjab, with 97 percent of its land irrigated, and Haryana, with 84 percent, vastly improved their irrigation facilities between 1966 and 2009, the period of this study. In becoming key producers of rice and wheat for the country, these states have also become the largest sources of agricultural water demand. The irrigation needs of wheat, a Rabi crop, have driven 69 percent of the increase in demand for water for agricultural purposes. Rice, meanwhile, is the most inefficient crop in nutrient production as well as water usage, in both the Kharif and Rabi seasons. 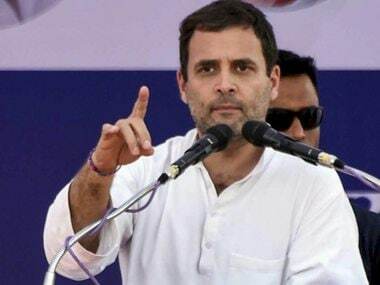 Consequently, replacing the rice grown in the northern grain belt alone with alternative crops would deliver substantial water saving, and "about half of total water savings from replacement would come from just 39 districts, most of which are in Punjab and Haryana", Chhatre said. The study has found that in the last 40 years, the burden of water stress has shifted away from the southern districts, some of which have experienced a decrease in agricultural water demand, towards Punjab and Haryana. 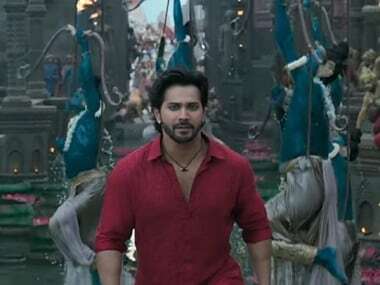 "While India has done well to prioritise calorie production to avoid widespread hunger, now, considerations like nutrition and environmental impacts cannot continue to be side-stepped if the country wants to achieve better health for all and environmental sustainability," he said.